I’m a 45-year-old mother of four who has spent the past two decades of her life running a household, raising my kids, and trying to keep it all together. I knew little of the contemporary artists and had no experience with artistic practices. Tired of the repetitive nature of the work-home-work-home cycle, three years ago I quit my job and went back to school. I felt old and stupid and overwhelmed by the workload. 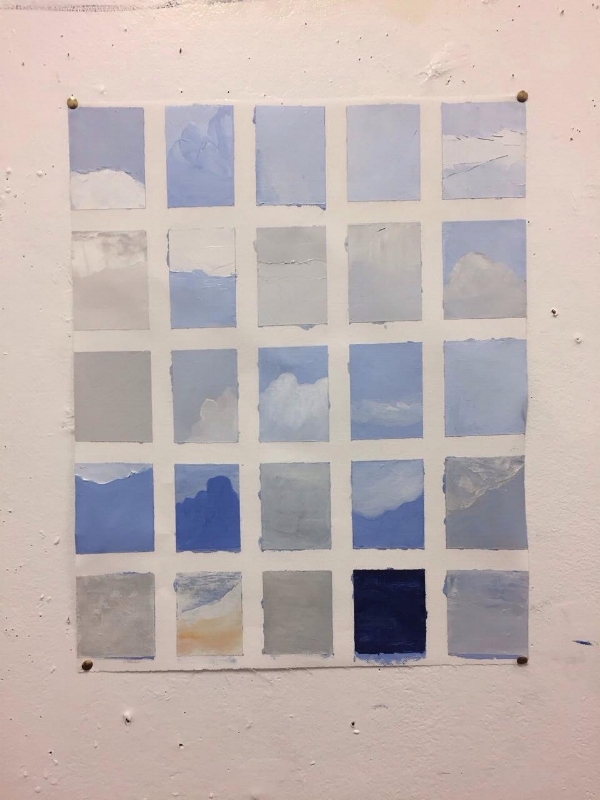 The second semester I decided to “treat” myself to an art class as a way to combat the stress of my other classes. It was no cake walk. In fact, I spent more time agonizing over my homework in that drawing class than any other class. This summer, after realizing how intimidated I was by oil paints, I decided I was going to woo them into a loving relationship by making a daily rendezvous with them. Each morning, afternoon, or evening, I selected a few colors and tried my hand at mixing a hue which seemed to match the sky at that moment. In three colors or less, I painted with a brush or palette knife, on one small patch of canvas. This color represented the spit of sky between the neighbors’ garages observable from my window. By the end of the summer, I think my pursuit of paints has led me to regular trysts. I wouldn’t say we are serious. I think the world of her, but sometimes it feels like work trying to keep the passion hot. Maybe we would be better as friends-with-benefits? Ellyn is currently pursuing a major in Philosophy and minors in Art and Biology at Moravian College.